The August issue arrived on my iPad on the 19th of July – just as I was heading out for quick one on the way home – which turned into a pizza at Bella Pizza followed by further shenanigans at Uncabunca … one arrived back in the Hole at 2:30am and in no condition to read. As I staggered in though I also checked the letterbox and found Strategy and Tactics – War in the Pacific and Slingshot 287 Mar/Apr 2013 in there as well so my reading pile had increased considerably on that one night. Saturday was, of course, the Rapid Fire – Game 1 – First Battle in the Gun Bar and BBQ day so no chance of reading then and Monday and Tuesday I have been pouring over Slingshot and S&T, planning the rest of my week’s reading and wondering where I put the 10mm War in the Pacific figures. I noted before that I was hoping that Miniature Wargames with Battlegames (MWwB) would improve and I think it is starting to come together now. 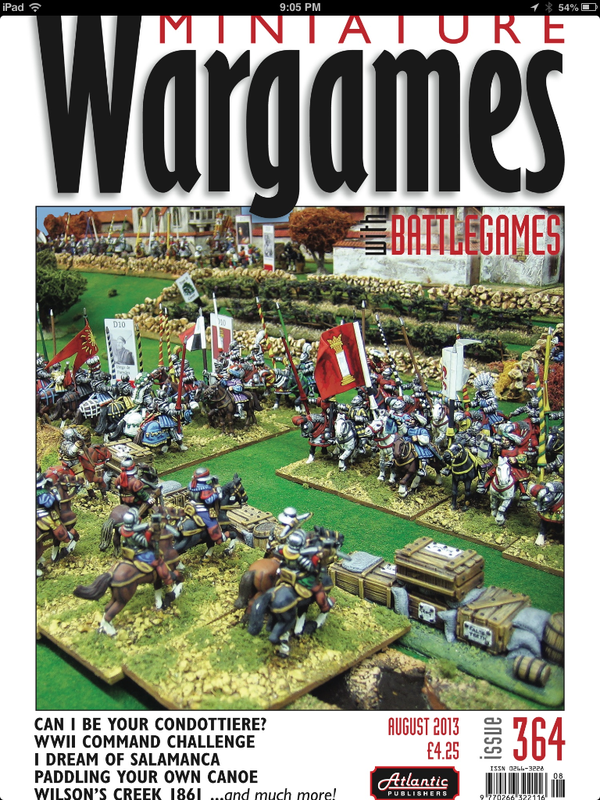 I will admit straight up that my favourite wargame magazine at the moment is still Wargames, Soldiers and Strategy but MWwB is starting to get there – and like WSS this is a digital edition. This month’s issue has the usual columns and sections – Neil Shuck handling Forward Observer for wargaming generally following on after Henry’s editorial. Perhaps my favourite regular piece is Diane Sutherland’s terrain and other item constructions and this month she is building canoes. John Treadaway is now a regular looking after fantasy and science fiction and is always an interesting read. John is also talking to Kevin Dallimore (that legendary painter of figures) later in the issue and I am certain that will be my evening’s reading tonight over a pork chop. Conrad Kinch’s column may be an improvement on last month’s (I won’t know for a while as that is about the last thing I read there) and Richard Clarke of TooFatLardies fame who is an interesting read and is presenting a Command Challenge (although the cartoon like call-outs in that article are a bit 14-year-old schoolboyish). Mike Siggin’s is waxing something again and there is the usual Recce section towards the end. Overall, it looks like the magazine is improving – let’s hope it continues to do so.